Charleston Rainbow catcher Lee Henderson took the throw, but it was too late. The Sumter runner rounded third and broke for home as another runner got caught in a rundown. Henderson caught the throw home, but the runner evaded his tag, according to The Sumter Item. At the plate, Henderson went 1 for 4, knocking in one. It was a game Charleston would drop by a score of 4-2, The Item wrote. Henderson was in his second season as a pro that year. He went on to play in five more. He made AA, but he never made it higher. Henderson's career began in 1989, taken by the Padres in the 10th round of the draft out of West Covina High School in California. Henderson played his first season in the rookie Arizona League. In 35 games there, he hit .210. He moved to Charleston for 1990. In 87 games there, he again hit .210. He went 0 for 2 in a June game. 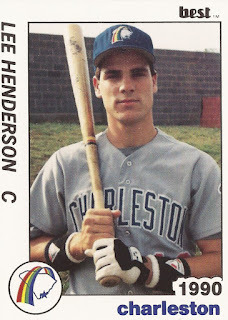 For 1991, Henderson played at single-A Waterloo. His average was virtually the same, .213. That average improved at high-A High Desert in 1992. He hit .275 there. He also hit his first three professional home runs. Henderson got his only look at AA in 1993 at Wichita. In 31 games there, he hit .176. He returned to high-A Rancho Cucamonga in August. Henderson played just one more year in affiliated ball. He divided 68 games in 1994 between single-A Springfield and Rancho Cucamonga. He hit .234 between them. His final professional season came the next year, with 34 games at independent Duluth-Superior, ending his career.